While we continue visiting all the wonderful tablescapes posted for Tablescape Thursday, I have another fun little napkin fold to share with you today. This fold creates three pretty little pockets where you’ll be able to tuck in flatware or place cards or flowers or even a little favor for your guests, if you like. 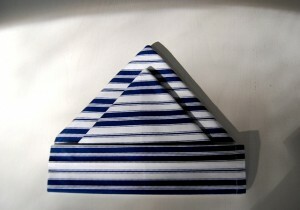 Today, we are making the, Triple Pocket Fold. I didn’t take time to press this napkin once I finished folding it, but I do think it would look better if the little pockets were pressed down some with a warm iron. I used a 16″ square napkin for this fold, but this particular fold looks more elegant with a larger napkin…like a 20 inch. Pssst: Postcards From the Porch, the BNOTP newsletter will go out this weekend. If you’re not currently subscribed (it’s free!) subscribe to receive it here: Subscribe to Postcards From The Porch You can subscribe to my daily blog post updates at that link, as well. 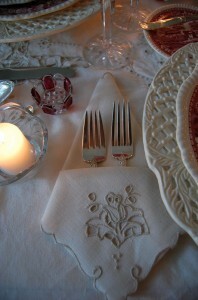 Looking for other creative napkin folds? You’ll find lots more here: Napkin Folding Tutorials . That's a great tutorial ~ very easy to follow. I like that you can tuck in a flower or card. Thanks! Thanks for the tutorial! I will have to try it. wow.. Thats superb!! I love it!!! Fantastic tutorial!! Its g8t to find all the decor related posts on your blog under one tab. Thank you for the tutorial! Very clearly shown! I will try this later when i get home, thanks!! This is a great tutorial! I can't wait to see more of the napkin folding!!! Susan I really love this look, very elegant!! I have a Luxurious New Giveaway on my site….Come and enter!! Great tutorial! I saved this post to refer to when I need it. Thanks! Very nice! Easy to follow directions, too! I really like the folds where you can put the silverware or what ever in a pocket. Looking forward to more from you! Thanks for sharing! I really like this one Susan. I used your first one for a dinner, will now have to try this one. I love your site, I do not have a blog myself, but follow yours. this looks really elegant. I have to remember when I do another tablescape. What a great tutorial, you've made it very clear and easy to follow-thanks! Great. thanks for the tip and tutorial. Thank you for the step by step tutorial! I think I better print this out! 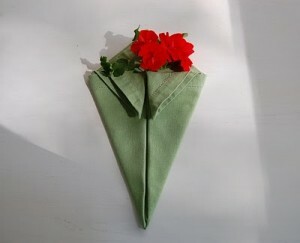 There are a lot of things to remember to make this elegent folded napkin. You are so sweet to share. I love the arrows, because I need details! Thanks for this! Your pics and instructions are very nicely detailed! Love it! Thanks for the tutorial! I will try this very soon. Great tutorial. Step by step is what I need. I will bookmark your page and look forward to more. Thanks. Excellent tutorial – thanks so much! can't wait to try it out. This is awesome! You are so helpfu. I am learning so much from your blog!! Thanks for the tutoral.This would be nice for special occasion tablescape. Thank Susan! for the tutorial. You giving us the opportunity to show all the linens that we collect,that way thay get out of the linen drawer. Thanks for the tutorial. I love napkin folding. It just makes every meal seem more special. Keep the great ideas coming. Great tutorial! I love a sprig of rosemary tucked in a napkin. We did this for my daughter's wedding. Just a nice little extra touch and smells yummy too. 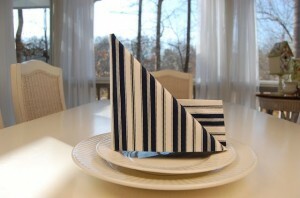 I love your napkin folding tutorial! The photos and notes make it seem easy. THANK YOU! I've never been much of a napkin-folder, but your tutorials have inspired me to dress up my table a bit more this holiday season. Love your photos and step-by-step instructions. Thank you! I just finished folding 10 of these for my Thanksgiving table. Thanks for this great tutorial, they look beautiful!